In my initial initiation, I began traveling within the Spirit realms into other dimensions early in childhood. I journeyed into unusual strange realities it seemed, sometimes full of love and light. Still, many times the places were of darkness and I had the feeling of being lost. I am told the abusive childhood I endured probably caused a tear in the matrix system of my young developing mind shattering the usual boundaries. At 11 years old, I had an epiphany. I knew the madness I was living in somehow stood for a reason and through this trauma, I was going to help others one day. I believe the trauma of my childhood has initiated and gifted me the ability to more easily see and commune with the spirit world. Magnitudes of mystery that in truth reside right here, right along side of us in other dimensions, worlds that most don’t see because of the conventional boundaries and our conditioned minds. As a child, I heard myriad of voices in my head. Feeling these energies viscerally, sometimes even seeing them, it was spooky. These experiences were persistent and with no one to understand, I felt afraid, alone and different from other kids my age. Blue was the color that accompanied black on her body that was beaten for her sins forth and back. Not a wonder she's a quiet girl, "cat got your tongue?" they’d say to her in school, "don't bring her around our group, she's not cool!" So she wore her clothes in layers to avoid the many stares, "what an interesting fashion", the girls her age would say. Her style showed such passion and she preferred it more that way. But the secrets went on hidden, her body feeling smitten under clothes of baggy layers, and avoiding any glares. …………………We'll just hide them…under gauze…………………. The girl in many layers tried so hard to hide the tears, but the inside was ignored, all the pain she only stored…No layers thick or thin could hold that torment from within. to reclaim her soul...all lost parts of self…She called to return. I empathize now that most of the ghosts were attracted to me because they really just wanted me to understand and help them, and in this love they were able to transcend. I have learned to assist them in passing over to the other side. And it is an honor to do so. As a child I did not understand. There was not much offered in those days to me that spoke to the reality of these entities existing, besides scary movies. No one else I knew had these experiences. I wondered, why did I? I thought I was possibly crazy. I often lived in fear of the ghosts who made them selves known to me. Still, surrounded by some spirits, I felt a deeper comfort with them then the humans in my world. There were many who were helpful spirits, spirits of the Light. The Tall Ones, or Guardians are Spirits began coming to me as a young teenager in 1974. The first visit came while my family was visiting relatives in Northern California. I lay in the bed next to my cousin to sleep that night. Suddenly a loud humming noise grabbed my attention and as the sensations grew throughout my body starting at my feet, I soon noticed I was unable to move or speak. Paralyzed, I tried to get the attention of my cousin and although my mind was wide-awake, I was held suspended not able to move or communicate until it broke. That first night, this frightening experience happened three times in a row. Terrified I ran to my mom each time. She suggested the experience was due to anxiety with the hardened relationship with my father. Worried, she timidly explained them away as stress. She didn’t know, how could she? Whenever the loud humming began, my body tingled in electric shocks and vibrations would freeze me in terror. I was suspended and trapped in some dark warped dimension. By my late teens, the visits had become more and more frequent. But after that first night, I remained silent of the ghosts I believed were haunting me. Never knowing when they would come I was frightened to lie down, my life seemed out of my control. I feared my father had driven me crazy. The idea of getting an art scholarship, when graduating from high school in 1977 was flattering, as I romanticized the great masters in art school. Art was my life. Still for me, actually attending art school was very disappointing. Insecure from the beginning I did not do well with an overload of instructors in the scholastic formal setting with projects due and rules to follow. In 1977 within my first semester of college I became pregnant and officially ended my formal art schooling. Unaware at the time I was suffering from post-traumatic syndrome, I suffered an emotional breakdown, in 1978, six months after my first son was born. In this trauma, at eighteen years old, a blessing in disguise occurred for me. I landed in a Psychiatric ward for trying to commit suicide. The emotions I had held in so deeply throughout my childhood began to purge. The c-section that occurred in birthing my son. The operation triggered and re-traumatized of a serious operation I experienced at four years old. I simply wanted to die, no holds bar. While in the psych ward, I had a particular traumatizing visit. This time a cold wind accompanied and blew my hand flat to my chest and the paralyzing began. This threw me into traumatic terror and after I broke free, I ran through the halls of the hospital, wild in my search for safety, screaming for a way out. My display of frenzy got the attention of a young doctor. He sat me down and in a grateful and desperate plea I finally spoke of my secret I had carried in terror all these years. I told the therapist what had been happening all these years. An angel I believe sent to help me. This is why I was there. And, in looking back I can see this was a shamanic training as well. Advanced spiritually for his field, after I shared with him my story, the therapist taught me biofeedback. A relaxing technique that helped me bring my conscious mind into a deep relaxed theta brainwave state. He suggested I try not to be in fear when the sensations came upon me, but instead, relax into it. He suggested I open my eyes, look around, and see what’s happening around me in the room. Inspired, devoted and driven. I finally felt like I had some direction, a tool I could use to explore this crazy terror. I practiced everyday loving the exploration of my consciousness. I learned I could bring myself into this theta state in less than five minutes. While there, the humming and tingling sensations would begin. I consistently needed to talk myself through the fear and tell myself not to be afraid. Every single time, when I opened my eyes, I found I could see everything in the room multiplied into a weird sort of quadruple vision. I quickly learned that I much preferred this new world I had found… to the one I was concurrently living. And I spent much time there exploring. Every time I probed into this realm I could feel and see three very tall beings to my right down towards my feet. I call them the Tall Ones, the guardians. They didn’t appear to me to have faces, or feet. Wearing robes their bodies were translucent. Still even then, “they” didn’t frighten me. They seemed to just be watching me, like guardians. Their energy was calm and peaceful, and I knew they would not hurt me. I felt comforted by them and even though it was always necessary to talk myself through the fear of the paralysis and vibrations, after that I always welcomed the visits. 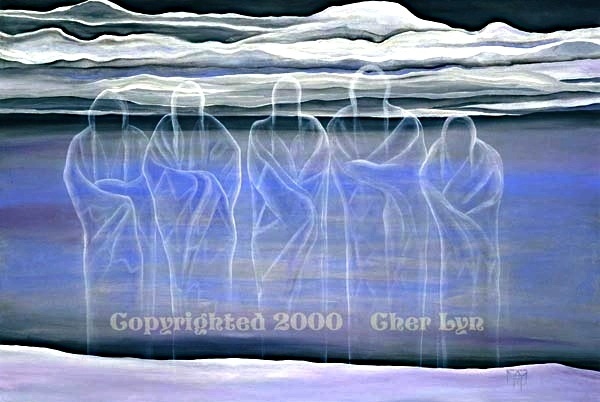 I came to the realization that the legions of angels who surrounded me were not going to stand by and let me die. I was not alone, and I could do this thing called life. I was sick of the mental institutions saturated in medications, coffee and cigarettes. I watched a girl loose her spirit through shock treatments. Feeling unworthy, I believed I was going crazy and I think that was absolutely a choice I almost made. At that time, to kill myself seemed like the only way out for me. Presented with two very divergent paths, I realized I could easily continue to paint the path of the victim and loose myself. Instead I chose to empower myself and do life, or at least try it for a while. I sought desperately for some common place. I consistently asked a lot of other people about these suspended sensations and the beings I saw. I wanted to know if anyone else had this too. Some said it sounded like I was soul traveling, or having an out of body experience, at the time these terms were foreign to me, yet I was curious. Still most people looked at me like I was crazy and no one had experienced what I had. In those days I wasn’t sure of anything, I doubted my sanity. Eventually, I went back into silence about the strange visits, again fearing I was insane and knowing I was unlike anyone I knew. In my early twenties I had a frightening experience with another being that came to me while I was having one of the vibration visits. He stood leaning right over me focusing over my heart and solar plexus. He was not like the Tall Ones, my guardians. He was a different body type, short and very muscular. The Tall Ones always respected my space and never came uncomfortably close. I didn’t like the feel of this guy at all. Thrashing through the paralysis with all my might in my mind, I fought him like a warrior, until I was actually able to sit up. Never had I been able to move in this theta’s paralyzed state before. Tight fisted and terrified I stopped welcoming the visits. Periodically they tried to come over the years, but when they did I was able to shut them down almost immediately. It would be twenty years later I was to meet the first person I found who had a similar body sensations and paralysis. The first person who could give me some real suggestions to what was happening to me. He is a scientist, archaeologist and anthropologist. One day in 1995, Hank spontaneously started having spiritual experiences, which took him exploring other worlds 5000 years into the future. The author of a trilogy of books, Spirit Walker, Medicine Maker, and Vision Seeker, Hank Wesselman, He was a man structured purely as a “right brained logical.” He didn’t believe at first in the paranormal or the spiritual. He was part of the research team that excavated the partial skeleton of "Ardi" (for Ardipithecus ramidus) in Ethiopia that is four and a half million years old and is so primitive that it may be the famous missing link between apes and humans that Charles Darwin predicted that we would eventually find in Africa. Today he continues his research with this team, despite his unusual books. In a nut shell, I discovered Hank had similar paralysis and humming vibrations somewhat similar to my experiences. He shed more light for me through his personal experiences and the potential for me to explore within this strange phenomenon. With his encouragement, he taught me shamanic tools, protection methods and suggested I invite them back. I decided to welcome my old friends to return if they would come. I use the drum in journeywork often by myself alone in my studio. Where I drum myself into other worlds, where I meet up with guides to receive insight. So with his suggestion to ad protection, I invited the Tall Ones, my guardians back to visit with me in my journey. This particular time there were six of them present. It was a warm reunion. Their calming peaceful loving energy comforted me again. I could feel them softly brush up against me actually touching me for the first time and for the first time, I was not held suspended and paralyzed in their presence. Our small little minds can’t begin to logically explain these strange paranormal experiences, Creation, or the Universes. The unknown has terrified us. We have grown up in so much negative programming. Science hasn’t supported us in the past, but is beginning to now. Spirit Walker, Medicine Maker, and Vision Seeker. Visionary Author, Shaman and so much more, Hank Wesselman.